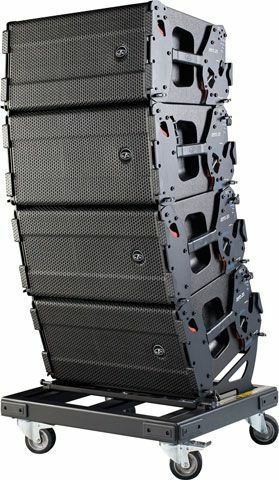 The What: The Aero 20A is a compact line array system which incorporates the ALAS philosophy and draws from the astounding success of the 'all purpose' capabilities of the Aero 12A, launched in 2009. The powered Aero 20A incorporates D.A.S. 's latest technical achievements in transducer design, power electronics and system management. The What Else: The low-mid range incorporates a new D.A.S. 12-inch loudspeaker optimized to provide high output and reliability. A light aluminum voice coil bonded to a new fiberglass reinforced cone, an optimized magnet circuit, and a new suspension design have contributed significantly to the performance of the 12AN4 in terms of distortion, power handling and maximum SPL.High frequency response relies on a compression driver-waveguide assembly developed for the Aero 20A. The M-75N compression driver employs a powerful neodymium magnet structure, a titanium diaphragm and 75 mm (3-inch) voice coil. A reengineered mounting system which tightens internal tolerances along with a new shorting ring design have increased the power handling capacity of the driver. The M-75N is attached to a new aluminum waveguide that has been designed to be free of resonances and provide a natural sound. The Bottom Line: The Aero 20A provides the high performance live sound market with a cutting-edge product.